Cheese and bread.... comforting and hearty! You can never go wrong with this favorite combo. Well, my family loves Grilled Cheese Sandwiches, Cheesy Quesadillas, Paneer Paratha. These are my go to meals for Sunday brunches or any special day. This weekend I made Paneer Pyaaz (Onion) Paratha. Melted butter on those golden brown parathas makes it totally irresistible. Start with the dough. In a mixing bowl, add wheat flour and little salt. Add little water, at a time and knead until the dough gets soft and smooth. Cover the dough with plastic food wrap and let it rest for 20 - 30 minutes. Meanwhile, prepare the Paneer pyaaz stuffing. Finely chop onions, green chilies and coriander leaves. Grate the ginger and garlic. Grate the paneer using a grater or crumble with your hands. Heat oil in a pan. 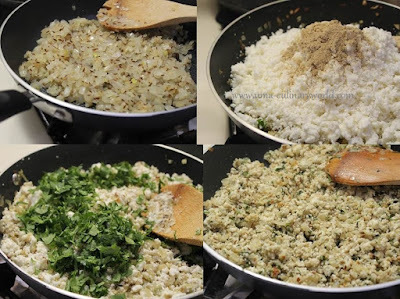 Add cumin seeds and after few seconds, add onions. Saute until onions soften. Next, add ginger, garlic and green chilies. Continue sauteing until onions turn slightly brown. Next, add crumbled paneer, chat masala, red chili powder, salt and cilantro. Saute at low heat until all the ingredients are mixed well, about a minute or two. Taste the stuffing for salt and other seasonings. You can add 1/4 - 1/2 tsp Garam Masala or any other seasoning of your choice as well. Let the Cheese Onion stuffing cool down completely. Now comes the part of making the paratha. Knead the dough again and divide it into 10 parts. Roll each one between your palms into a round ball. 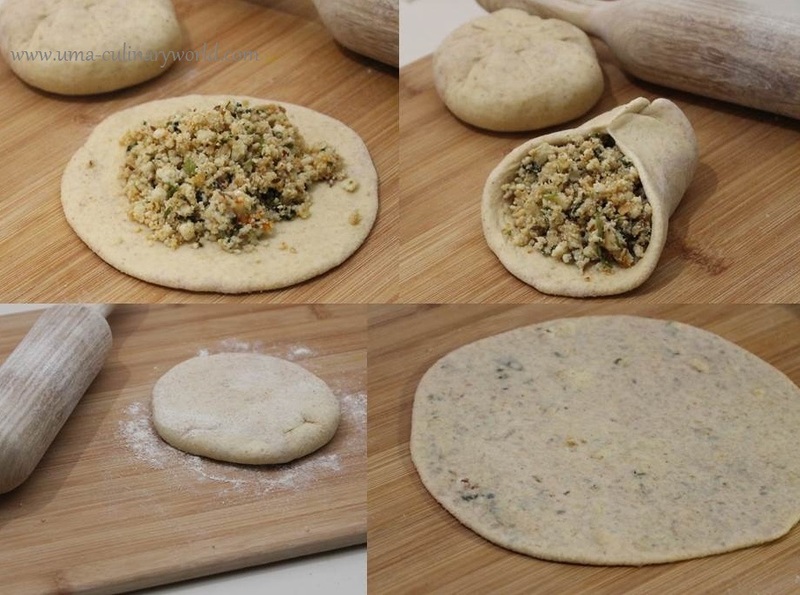 Sprinkle some flour on the work surface and roll each dough ball as big as a puri, about 4 - 5 inches in diameter. 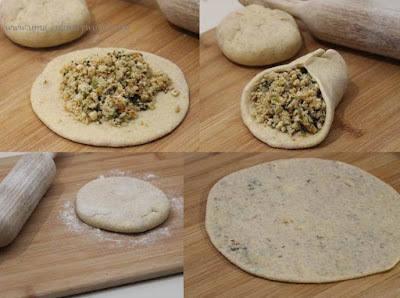 Place 2 - 3 tbsp stuffing in the center of each rolled puri. Gather the edges to form a round ball. Let the stuffed balls rest for a minute or two. Sprinkle some more flour and flatten the stuffed ball with your palm. Gently roll each stuffed ball as thin or thick you like. Heat a griddle/tawa and roast the rolled parathas until golden brown on both sides. Drizzle some oil or ghee or butter while roasting parathas. I like butter for that golden brown color of paratha. Enjoy hot Paneer Pyaaz Paratha with yogurt, ketchup or a curry. In case you plan to freeze the parathas, let the parathas cool down completely. Cover each paratha with a plastic food wrap. Then put them in a freezer safe bag and put it in your freezer. Reheating is simple, just heat them on a griddle or tawa. See you soon folks! Until then, take care..